In the days leading up to the 2nd of October, 2014, Sikorsky Aircraft took to social media to get people hyped up for a long-anticipated reveal of their next revolutionary helicopter. Sure enough, the matte-black contraption sitting upon a stage in West Palm Beach, FL, in front of various executives, defense officials and journalists fit the bill of revolutionary and stunning. 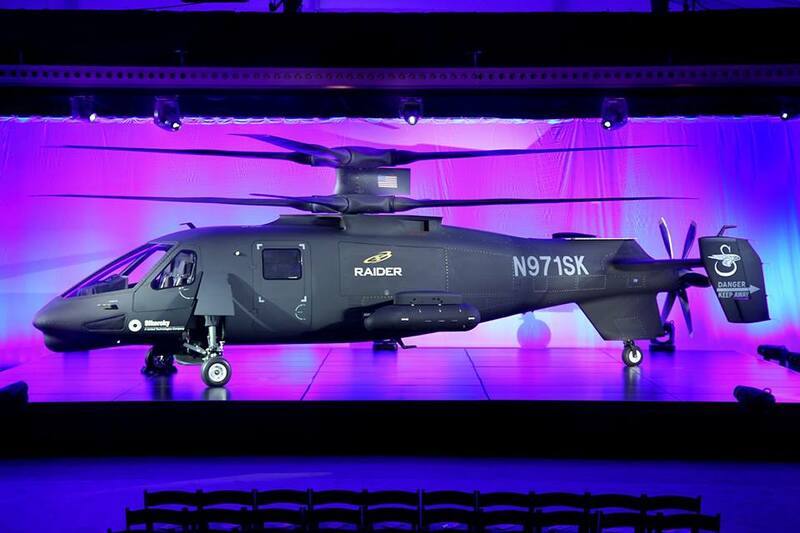 By the time #RAIDERrollout was complete, the defense industry had its first glimpse of the S-97 Raider prototype, an aircraft that has to be seen to be believed. Sikorsky initially put forth the Raider as a viable option for the Armed Aerial Scout program to replace the OH-58D, now already on its way out of Army Aviation. 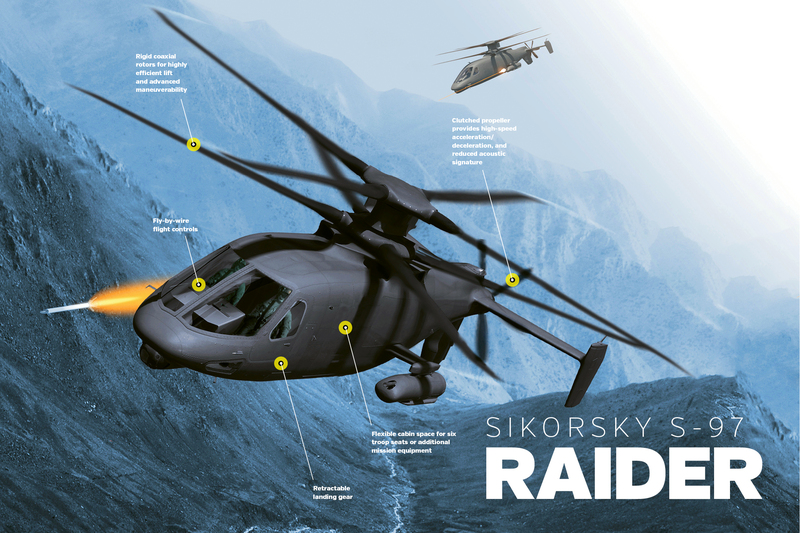 However, AAS was suspended last year due to financial and budgetary concerns, leaving Sikorsky with the task of marketing the Raider to the Future Vertical Lift program instead. Luckily, they didn’t have to do much in the way of modifying their proposal. At the moment, Sikorsky hopes that the United States Special Operations Command takes notice of their new chopper as a potential replacement for their AH/MH-6M Little Birds, currently flown by the legendary Night Stalkers of the 160th Special Operations Aviation Regiment (Airborne). If you haven’t already noticed, the Raider veers away sharply from the conventional helicopter design that we’ve gotten used to: a boxy airframe with a solitary main 2-or-4-bladed rotor above, supplemented by a tail rotor for stability and maneuver control. Instead, it has a set of coaxial rotors and a pusher-propeller in the tail boom, all attached to a GE YT706 engine, coming together to give it a speed of up to 276 miles an hour when unarmed, a whopping 76 mph more than the Westland Lynx, one of the fastest production helos in the world. The composite platform can carry up to around 11,000 pounds of external stores and internal cargo or six kitted-out troops in the rear bay with two crew up front piloting the aircraft. The entire concept, called a “compound helicopter”, is based on Sikorsky’s X2 demonstrator which had a similar configuration- coax rotors and a prop for forward thrust. 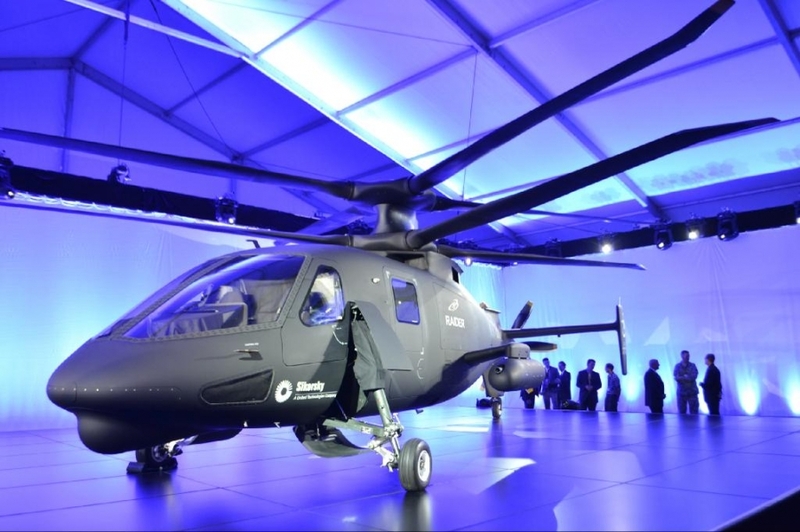 The X2 proved to be a major success and will likely serve as the foundation for other Sikorsky designs entered into the Future Vertical Lift program. The S-97 essentially builds on lessons learned from the X2’s test flights between August 2008 and July 2011, bringing more maneuverability and speed to the fight without compromising on payload capacity. Advanced electronic sensors will be set into the all-composite airframe, and the Raider will be able to be flown by the traditional two pilots up front, one pilot alone or, should the mission call for it, autonomously. Removable stations on both sides of the Raider can carry combinations of rocket pods, AGM-114 Hellfire missiles or machine guns. Altogether, one very potent aircraft. The Raider is slated to take flight later this year, far ahead of other potential competitors vying for the FVL’s Joint Multi-Role Light contract for an armed scout helo in Army squadrons by 2030. Let’s just hope that it doesn’t go the way of Sikorsky’s last unconventional helo. You can read more about the Raider on its main product page.